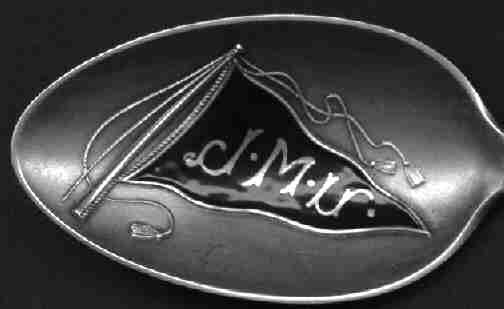 College and University spoons are not rare in general, but the finding of a spoon commemorating a specific University is quite a difficult feat. I have been unable to locate a spoon for my own alma-mater, but have been quite successful in finding a number of spoons for other Universities. The female graduate handle is commonly found, and the commemoration in the bowl may be for either a college or a high school. The male graduate handle is rarer, but not overly difficult to find. 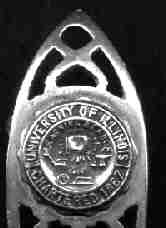 Of course, many other handles are used on spoons commemorating different colleges. It is not possible to show all of the college and university spoons, so I have selected a few for presentation here, but there is a list at the bottom of others which I own. If you have an interest in one of those, please email me. Arch, Stanford Univ., Palo Alto, Calif. Harvard University "Fair Harvard"
All gold washed with enameled bowl "universitatis kansienesis"
A nice California Bear spoon with an enameled finial stating "California". 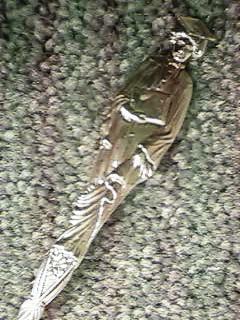 Probably from UC Berkeley (San Francisco), back engraved "best wishes"
Very nice enameled spoon from ISC. 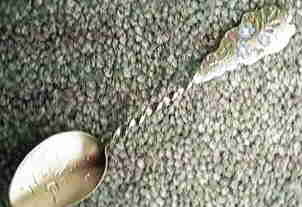 I am not sure which college this spoon is from (readers?). I suspect that the enameled "A" stands for "Alumnus". The symbolism also includes an "owl" and a "globe" and on the back a "book". The enlarged football scene is on the back. The back also has golf clubs which can be seen on the sports page. Dark Blue Enameled bowl "JMU"--readers any idea? This tea spoon has a very nice overall design. 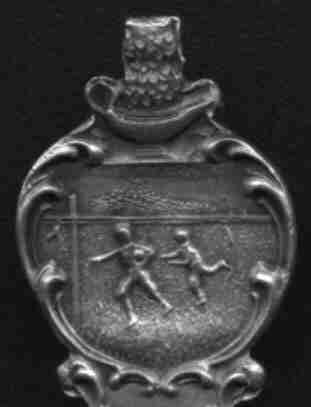 the handle is a very finely formed tree with the tennis racquet and ball in the oval and of course the beaver at the top. The bowl has a picture of the University of Toronto, but I have seen similar spoons with other designs in the bowl. A close up of the tennis racquet is shown in the sports exhibit. The Following College or University spoons are in my collection. If you have an interest in one of these please email me. These are not in any particular order. Allen Steinheim Alfred Univ., Alfred, N.Y.
Peerskill Military Academy, Peerskill, N.Y.